The home screen as it stands cannot last. In reality, what we’re looking at is the end times for the traditional grid of icons that we’ve become so familiar with since the iPhone was introduced in 2007. There is simply too much context available via the sensors, camera, radios and other inputs we carry around in our pockets not to take advantage of it. The icon grid design was used in many early smartphones running Palm and Symbian and Windows Mobile. But the iPhone really launched that design into the public consciousness and then Google cemented it with the launch of the first touch screen Android device. I’m not here to argue about firsts, but Apple was essentially responsible for making the grid the ‘standard’ in the eyes of a lot of people — both iPhone users and people who picked up other smartphones running on other operating systems. But, seven years later, the choices made by Apple to honor the grid demand re-examination. The thought process is relatively simple to disassemble. The grid had been used by other smartphone makers and even Apple’s Newton. It was simple, easy to understand and friendly to people who were being introduced to multitouch — which was for most people a brand new way to interact with touch screens. This was the same process which led it to utilize real-world allegories like bookshelves, page curls and ‘buttony’ buttons. But that home screen belongs to a bygone era. We’re acclimated now and any new users of smartphones have the collective installed user base to help them along. Now is the time that the home screen begins to take advantage of the thing that we’re going to be hearing an absolute junk ton about in 2014: context. I have a ton more thoughts about why 2014 will be the ‘year of context’ for mobile software and hardware, but for our purposes it’s enough to point at a few recent trends. Among those are Google Now, Apple’s ‘Today’ section in Notification Center, Facebook Home, Cyanogen Mod and home screen customization companies like Everything.me and, yes, Aviate. These various products are all efforts to leverage the contextual signals that our mobile sensor platforms are able to collect and transmit. Where we are, who we are, what our intent is, what our environment looks and sounds like and what we do when we’re there. That context can be used to customize the way that our devices look, feel and work based on our own personal signals. At this point, a home screen that customizes itself to you, personally, feels as inevitable as a well-worn pair of shoes. TechCrunch columnist MG Siegler noted a symptom of this recently. The ‘first app you open’ in the morning is becoming more important real-estate than your home screen. In reality the first app you open when you turn on your iPhone is ’springboard’, the home screen. But up to this point it has remained relatively static, with only a couple of minor nods to active icons like the clock and calendar. Android home screens have always been more malleable, allowing for personalization and customization on a deeper level. Which is why some people really like Android. But this isn’t just about customization, it’s about reaction and organization on a contextual basis. Which brings us back to Yahoo’s recent acquisition, Aviate. Aviate is a home screen replacement for Android that interprets signals from you, the user, to present you with the apps, content and alerts you want right when you need them or even before. It groups apps into automated collections. This makes the home screen simple and clean. 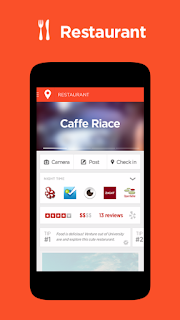 It also has elements of app discovery, says Aviate’s Mark Daiss. Aviate will look at the apps that you have and use the most and suggest more like it. 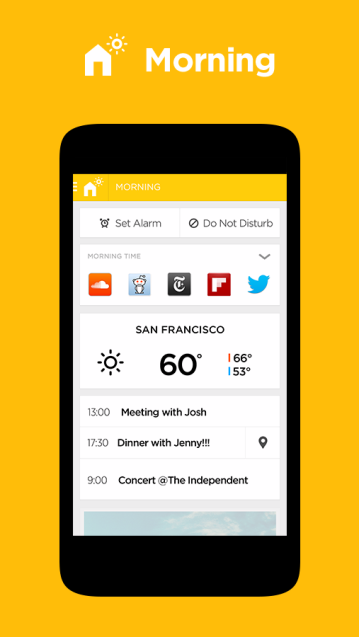 The goal for the first run at Aviate was to cover roughly ’80%’ of a user’s day, says Daiss. That includes the major components like getting up, traveling, working and going to bed. From here on out it will be about fleshing out the moments in between. Daiss credits Facebook Home for creating an awareness of what a launcher was and how a customized home screen could change the experience. Despite the fact that Home didn’t exactly turn out well, Daiss notes that other efforts like GoLauncher have seen success, with that offering currently clocking in at over 100 million installs on Google Play. One of the reasons I believe Facebook Home’s initial try failed was that it was too insular. Even the most dedicated Facebook user needs more than just one network’s worth of information. That’s why I was curious about Yahoo’s plans for Aviate. Yahoo SVP of Mobile and Emerging Products Adam Cahan says that the company isn’t interested in turning Aviate into some sort of ‘all Yahoo apps’ portal. For now, it will expand the beta program and get more users checking it out. “Think of this as an extension of [Yahoo] Search,” Cahan says. The extension of search metaphor is an apt one, as contextually aware home screens will be all about using anticipatory ‘searching’ through our apps, habits and use cases to provide us with better experiences. Aviate will now be able to tap deeply into Yahoo data like search, weather, maps and more to inform contextual experiences. But, Daiss is careful to note, Aviate will still choose the best, most definitive data source possible — even if that’s not from Yahoo. With the best data comes the best experiences. Daiss lays down the core components of what he feels a contextual computing experience are. First, it needs the right input signals, then it needs the information that’s pertinent to the situation and then it has to provide the right user experience. Part of what they’ve discovered at Aviate is that this experience often involves offering information and context from inside the apps right out on the home screen. But this isn’t a one-shot widget, this is a continuously personalized experience. One of Aviate’s more popular features is a ‘swipe down’ screen that can offer you context from inside various apps at any given moment. Swipe down at a restaurant and you might get information about what’s good to eat there from Foursquare or Yelp. Swipe down at home and you’ll get alarm settings, a do not disturb toggle and a schedule of meetings. If you’re an iOS user and this is sounding familiar, yes, this is why Apple acquired Cue. Because its swipe down ‘today’ section has the seeds of this kind of contextual computing, but it needs a lot of water and care to grow. Control Center and Notification Center need to grow up, quickly. (It’s also, I feel, one of the major reasons Apple changed its design so drastically with iOS 7 — it needed a more flexible framework to build within.) 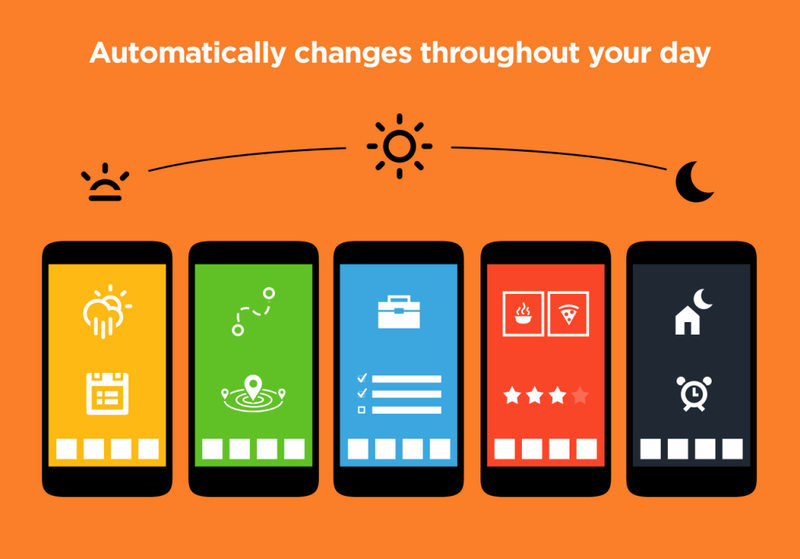 Aviate and other intent-based home screens are champing at the bit to offer people a better experience. And Google Now has an immense amount of head start simply by virtue of the enormous amount of data it has from its users. Unfortunately, once you start talking about how much these intent-based systems know about us and can anticipate our needs, the spectre of the NSA and government spying programs rears its head. Yahoo, Google and Apple were all targeted for data collection and that’s unlikely to go away. There are some incredibly complex and sticky moral quandaries headed our way with this new contex-heavy world, but that’s probably a discussion best handled in a focused chat about the trend. For now, we have Yahoo acquiring Aviate in order to make sure that it has a hand in this new world of context-based software. It has the resources to juice the back end with user data, and it’s going to be a big platform for Aviate as a (relatively) agnostic prototype of the custom home screen. And if it’s turning and burning as much as it appears to be on mobile, Yahoo is very interested in how this battle for the home screen turns out. What’s intriguing about this is that it’s very much a ‘technology company’ move. So much of the confusion about Yahoo and its new direction — I feel — has been rooted in the inability by some to come to grips with the fact that Yahoo’s new CEO Marissa Mayer is comfortable thinking of the company as both, and so are her new lieutenants. Yahoo has an enormous amount to prove still. No amount of hot young talent Botox is going to magically turn the company around. But I don’t find the company’s investments in technology confusing. In this new contextual computing age, if you’re a media company not investing in your own technology, you’re probably not being…anticipatory enough.